The XLSX file format is used by the Microsoft Excel spreadsheet application that is a part of Microsoft Office Suite of applications, starting from version 2007 onwards. 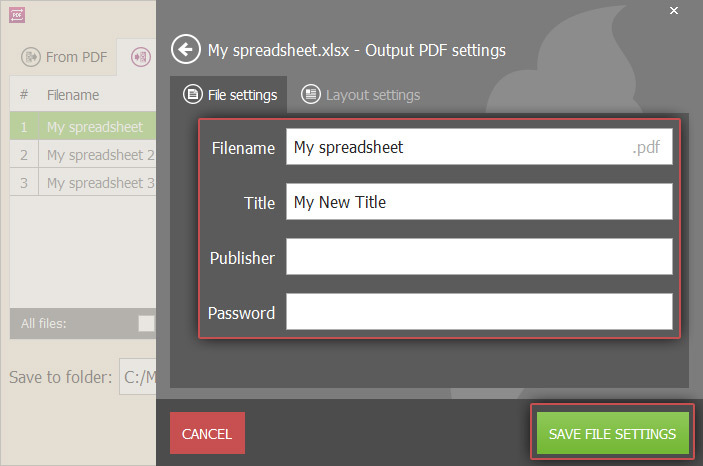 Several free to use spreadsheet applications like OpenOffice Calc and Libre Office support opening this format as well. However, this can result in loss of information, distortion of formatting, or even file corruption. To overcome these issues and to ensure cross platform compatibility, you can convert your files from XLSX to PDF format. PDF or Portable Document Format is recognised and supported by a wide array of operating systems, mobile devices and tablets. The format and data in a PDF file is preserved across platforms making it one of the most commonly used formats for file sharing in the Internet. 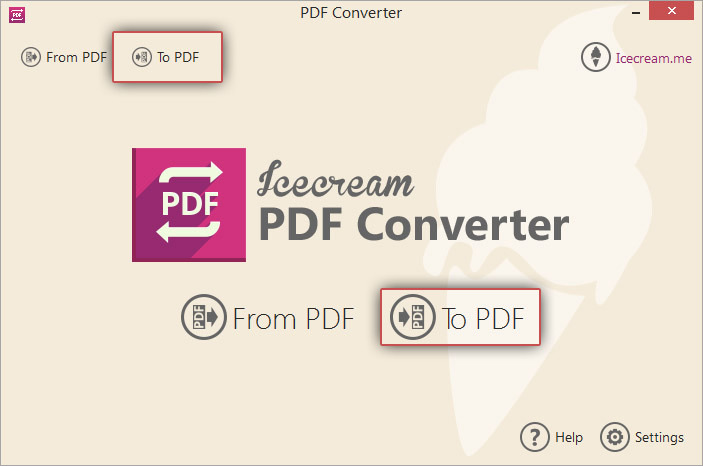 You can use Icecream PDF Converter to convert XLSX to PDF format by following the steps described below. Download Icecream PDF Converter installer from it official website. The installation wizard will guide you through the steps to setup this program to your PC. 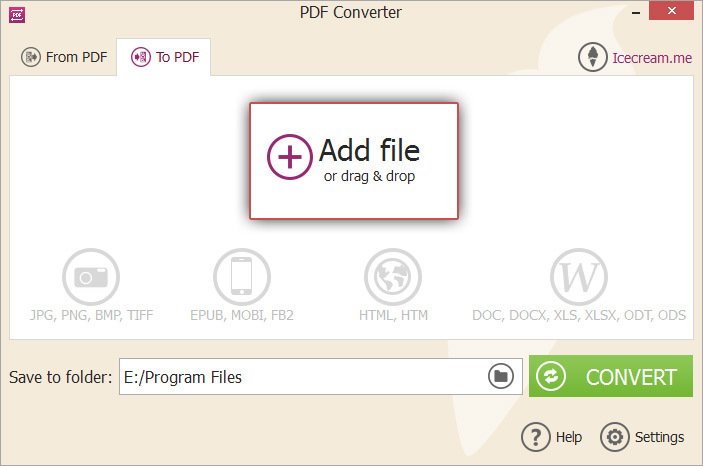 As soon as all the required settings are set, you can open the program to proceed with your XLSX to PDF conversion. Launch the application and select the “To PDF” mode indicating that you want to convert files from other formats to PDF. Add the XLSX files you wish to convert by selecting the “Add file” option. This will open Windows Explorer to browse for the files on your computer. You can also drag and drop the files directly to this window pane. All the selected files will appear in the queue. To remove a file from the queue, click on the bin icon beside the file. If you want to remove all the files, use the “Clear all” button in the bottom of the program's window. You can specify additional conversion settings for each file by selecting the gear icon beside the file in the queue. The below values can be configured in the Settings panel: Filename (the newly generated PDF file will be saved with this filename); Title (this text will appear as the Title of the generated PDF document); Publisher (publisher related information that will appear in the PDF); Password (protect the PDF from unauthorized access by specifying a password to open and view the document contents). You can use the gear icon from the bottom of the program's window to specify common conversion settings for all the XLSX files. Check the “Merge all into one PDF file” option if all the XLSX files are to be merged into a single PDF document. To re-order the sequence of the files, use the UP and DOWN arrow buttons in the right hand side of the window or drag and drop files to the desired positions. By default, the “Desktop” folder will be used as the target folder for all the PDF files. If you want to select a different folder, click on the folder icon in the “Save to Folder” field. Use the folder selection dialog to browse and select a new target folder of your choice. All the PDF files will now be saved into this folder. Verify the selected XLSX files, the conversion settings, the target folder etc. Click the CONVERT button to convert XLSX to PDF. Progress bar will show the current status of conversion with details like the elapsed time, the file being converted etc. “Conversion Complete” dialog box will appear with a link: “OPEN FOLDER” that will allow you to open and view the folder containing the PDF files. XLSX to PDF file conversion process is complete with the help of Icecream PDF Converter.